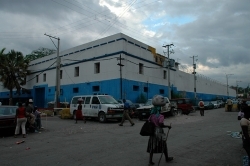 MONTREAL—Located in downtown Port-au-Prince, Haiti's largest jail looks like a stage piece: a blue and white fortress with high walls and square turrets of the type favoured by operatic drama. But inside the compound—guarded by UN soldiers and protected by an Armored Personnel Carrier—a tragedy of a more contemporary and mundane sort is playing out. Constructed in 1918 by US Marines eager to consolidate their occupation of Haiti, the National Penitentiary was designed to hold eight hundred prisoners. With only minor expansions since then, the facility now crams four thousand male inmates into an area of two thousand square meters. At a density of two detainees per square meter, conditions in the jail are undercut by four times the minimum standard established by the International Red Cross, which calls for an allowance of two square meters per inmate. Eyewitness accounts paint the picture of a packed environment inside the cell blocks, with prisoners' health further undermined by poor lighting and ventilation, a vitamin-deficient diet, and the prevalence of communicable diseases such as tuberculosis. Since the overthrow of Haiti's democracy in 2004, the country's prison population has more than doubled, rising from 3,500 shortly before the departure of President Jean-Bertrand Aristide to 8,000 today. Haitian human rights lawyer Evel Fanfan estimates that six thousand people were arrested in Port-au-Prince because of their political loyalties in March 2004, the month following Aristide's ousting. Although some were released soon afterward, since that time both the Haitian police and the UN peacekeepeing mission MINUSTAH (United Nations Stabilization Mission in Haiti) have conducted aggressive operations in poor sectors of the capital, drag-netting youth at a faster rate than the Haitian judicial system can process. "They are almost all poor," responds Concannon. "Over 80 per cent have not been convicted of anything. Many don't have a lawyer; most have been tortured." Concannon's group, the Institute for Justice and Democracy in Haiti, works in association with the Port-au-Prince based Bureau of International Lawyers (BAI), an advocacy group which was financed by Haiti's elected government until its funding was cut following the 2004 coup. Visiting the BAI office, I met my first case study of the post-coup Haiti incarceration pattern: Michaelle LaFrance, a former TV journalist who says she was arrested for wearing dreadlocks. Seated in the shaded courtyard of the building, LaFrance does her best to convey to me the atmosphere of class tension that gripped Port-au-Prince during the weeks before President Aristide's overthrow. Because Aristide invested in social spending, and applied protectionist measures to sustain Haiti's economy, he remained popular with the poor. He also drew the ire of neoliberal-minded donor nations, including the US and Canada, which moved to undermine him by channeling money to middle class-based opposition groups. In a repeat of scenes seen in Venezuela and elsewhere, affluent Haitians flooded the streets of the capital, calling the elected government illegitimate, and demanding Aristide's resignation. During this period, telejournalist LaFrance was physically assaulted while covering an opposition demonstration. Following Aristide's departure on February 29, a posse of former Haitian soldiers aligned with the middle-class opposition occupied the city. The names of wanted persons were read on the radio, and anyone or anything associated with grassroots activism immediately became suspect. Shortly after February 29, recalls LaFrance, who was 24 at the time, "The police came to my house. They took everything." Denounced by a neighbour, LaFrance says her dreadlocks stigmatized her because they were interpreted as a statement of loyalty to the poorer classes. Social profiling stories are common in a context where both the Haitian police and members of the hastily-constructed UN mission—dominated by the same countries that helped undercut Aristide—accept a middle-class narrative portraying Aristide's followers as a violent mob that needs to be controlled by force. Many of the men and women clogging Haiti's jail system are in fact minor casualties in the campaign of class repression. Arrested during an anti-gang sweep, fingered by a neighbour, or picked up for talking too loudly or angrily, they are warehoused for months to years while awaiting trial on vague or difficult-to-prove charges such as "associating with miscreants." In the case of known political organizers, however, the charges can be more specific. Ronald Dauphin, now 43 and Haiti's longest-serving prisoner, was arrested by paramilitaries on March 1, 2004, the day after President Aristide was forced from office. A member of Aristide's party and a port official from the city of Saint Marc, Dauphin was accused of participating in a massacre which reportedly occurred when anti-government paramilitaries clashed with police outside Saint Marc on February 11. Through more than five years of incarceration, Dauphin has maintained his innocence. The case has never gone to trial. Dauphin's 27 co-accused in the case include former Prime Minister Yvon Neptune, pro-Aristide activists, and at least one cabinet member. In a pre-trial indictment handed down in 2005, many details of the Saint Marc incident remain fuzzy. The document cites fifty killed, but identifies only eight casualties from the February 11 events, and furnishes no evidence about the whereabouts of missing bodies. Named witnesses claim that Dauphin was present during the clash, but do not specifically link him to either of the offenses for which he is accused: murder and arson. Writing in French, investigating Judge Cluny-Jules instead argues that Dauphin has been denounced by "la clameur publique," broadly translatable as by rumour. While most observers do not dispute that some sort of armed conflict arose between members of pro- and anti-government forces on February 11, it has yet to be demonstrated that government agents overstepped the bounds of a legitimate police action, or targeted non-combatants. I briefly met Dauphin at the National Penitentiary in April 2007, three months after one of his co-defendants in the Saint Marc (also known as the La Scierie) case, Wantales Lormejuste, died from untreated tuberculosis in the same facility. Though there were legitimate concerns about Dauphin's health—he suffers from a prostate condition—in 2007 he looked alert and was standing on two feet. In the intervening two years Dauphin's well-being has declined dramatically. Traveling to Haiti in April 2009 as part of a union delegation, California teacher Seth Donnely heard disturbing reports that Dauphin suffered from an acute, untreated illness. Accompanied by other delegates, Donnely arrived at the National Penitentiary on April 16 for a scheduled visit. Upon arrival, he says, "Dauphin was in fact very ill. He had to be carried out in the courtyard by other prisoners...During our visit, he collapsed. [He] was unconscious with his eyes wide open. He was not responding to pressure that was being applied by the health care professionals [there were two nurses on the delegation] to his sternum." In spite of complaints about headaches and abdominal pain, Dauphin had not been authorized to leave the jail for medical treatment. The nurses concluded that Dauphin "may have a septic infection that was spreading through his upper body." Many of Haiti's grassroots activists believe that extending pre-trial detention is a government tactic to neutralize or even kill unwelcome political actors without the worry of having to build a legal case against them. According to documents released to researcher Anthony Fenton under an access to information request, in March 2004 a Haitian NGO known as the National Coalition for Haitian Rights (NCHR) asked for and received $100,000 from Canada's development agency to prosecute the authors of the alleged massacre of La Scierie. NCHR's membership had previously stated a position which identified it closely with the anti-Aristide camp. In its funding request the NCHR promised to disburse money through a "victims" fund to citizens who had suffered from political violence in Saint Marc. The incidents that were eligible for compensation were limited to those which had occurred from February 9 to 29, excluding victims of the wave of violence against Aristide supporters that crested after the fall of the government on February 29. Using Canada's money, the NCHR thus conducted a publicity and legal campaign to push for the incarceration of pro-Aristide actors. But neither the NCHR nor the Canadian government has subsequently pushed for a trial, suggesting that open-ended detention, rather than due legal process, may be what they're after. Scratch the surface of the debate on how to improve jail conditions in Haiti, and two different tactics emerge: increase the amount of floor space by expanding or constructing jails, or reduce the number of prisoners by releasing those held on vague suspicions or for petty crimes. While the latter approach is favoured by social justice advocates, Canada and most big donors see "security" and the elimination of crime as the overriding priority for Haiti. This "security" priority requires more state investment in jail-building, and training police and judges. The logic behind this elaborate investment strategy is that foreign investors—especially in the manufacturing sector—will be attracted when they feel safe and to achieve this, Haiti must tackle criminality by disbanding gangs. In the years after the 2004 coup, a series of high-profile kidnappings, sometimes of foreigners, gave Haiti a bad name, and may have scared off investment. According to many Haitians, the problem of security has been sensationalized to justify class-based repression. Most of those imprisoned are extremely poor and have been the victims of social and political profiling. Many prisoners are being held for petty crimes for which they would not have been targeted if it was not for their low social status. Patrick Elie, a Port-au-Prince-based activist and former cabinet member, sees the path to economic development in Haitian-based agriculture, rather than investor-based manufacturing. According to Elie, most of Haiti's current crime is poverty-related, and for this reason investing in incarceration as a deterrent is a futile exercise. Jail construction and security measures are expensive, gobbling up scarce resources that could otherwise be invested in schools or agriculture, which would help reduce poverty in the long term. "When you have 70 per cent unemployment, and you build more jails, you'll be building jails 'til Kingdom come," he says. With Haiti still occupied by UN soldiers, the made-in-Canada ideology seems dominant for the time being. Under international pressure, the government of President Rene Preval, who succeeded Aristide, has promised to double the number of Haitian police officers, from 7,000 to 14,000 by 2011. Similarly, a quick glance at CIDA's website shows that a high number of big ticket projects funded in Haiti are directed toward "governance measures," including a commitment to build a new police academy at the cost of $18.1 million by 2014. Chris Scott is a member of the Montreal chapter of the Canada Haiti Action Network.